My students LOVE graphic novels. They don't care what it is about. I see them perusing the shelves in the library with frustrated looks on their faces and when I ask them my favorite question, "Can I help you find a book?" they respond with, "You don't have enough graphic novels." "Have you tried Pippi Longstocking?" "Do you have it in a graphic novel?" "Hm. No, what about Gregor the Overlander. It is written by Suzanne Collins! She wrote the Hunger Games!" "Is it a graphic novel?" I honestly can say that I don't share their love of graphic novels. My brain isn't wired to read that way. Alas, I do pick up a few because they are so well-loved. I will admit, I haven't read all the books listed below. However, these are the ones my kiddos love so chances are the young people in your life will love them too. I also find that kids who loved Diary of a Wimpy Kid and Geronimo Stilton are big fans of these books too, if that helps your stockings get stuffed at all. Sisters is the sequel to Telgemeir's hit Smile. 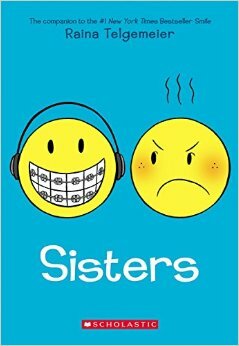 I haven't actually read Sisters but I did read Smile. Both are based on Telgemeir's own life experiences and my kids are ridiculously in love with these books. One student said to me today, "All I want for Christmas is Sisters Miss Howe." This student is a 9 year old Haitian boy. I am not sure if that is the demographic Telgemeir was going for but it definitely speaks to the breadth of the audience she is reaching. This book tells about what happens with Raina gets to be a big sister for the first time. 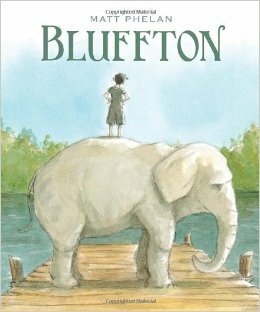 Bluffton, a graphic novel I have read, takes place in Muskegon, Michigan in 1908. The narrator, Henry, is enjoying his summer as usual and then a vaudeville troop comes rolling through town. In this group of performers is a young Buster Keaton. Henry becomes friends with him and enjoys many summers of getting to know jugglers, stilt walkers, elephants, and one of the greatest slapstick comedians ever. The story is based loosely on Buster Keaton's real summers in Michigan. It got great reviews from my kiddos too. 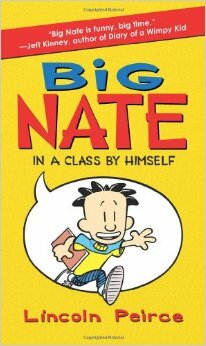 Big Nate is about a boy named Nate. The interwebs tell me he is a sixth grader who has a lot of adventures in school. My students and nephew tell me that they freaking love these books and just can't stop reading them! I need to read them, I know, but it hasn't happened yet. Meanwhile, kids who won't read anything else are reading these books. If you aren't sure what to get your kids and they haven't read these, this is a sure win. I don't get Baby Mouse. I admit it. In fact, as I mentioned above, I am not a fan of most graphic novels. But these Baby Mouse books? They are winning awards, they are selling millions of copies, and kids just devour them. Boys, girls, a lot around 8, 9, and 10 years old. 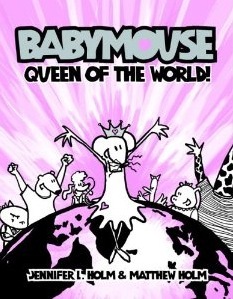 Baby Mouse loves glamor, she is sassy, and she is her own "person" no matter what. Want a double whammy this holiday season? Big Nate and Baby Mouse. Other graphic novels my kids love? Super Diaper Baby, Owly, Ook and Gluk, and Bone.